Reorders are fast, easy and totally secure. Black and White logos printed on your checks for FREE. Color Logos Available. DEFINITION of Voucher Check - A two-part combination of a check and voucher. Also known as a remittance advice, the voucher details the reason for the payment by the issuer of the check. 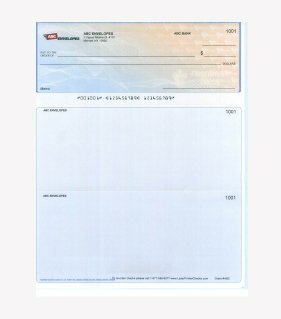 The recipient of the voucher check detaches the voucher and retains it for record- keeping before cashing the check. What are the uses of a voucher? A voucher is often a prenumbered form used in the accounts payable department to standardize and enhance a company's internal control over payments to its vendors and service providers. A voucher is usually prepared after a vendor's invoice has been matched with the company's purchase order and receiving report. What are QuickBooks Voucher Checks? QuickBooks Voucher Checks. QuickBookslaser-printed Voucher Checks automatically capture payroll deductions and invoice payment details, saving you time and reducing data entry errors. Do I Need a special Printer to Print QuickBooks Checks? There is no special printer required to print checks from QuickBooks. You can print QuickBooks checks using an ordinary Laser or Inkjet printer. Can I use Laser Checks in an inkjet printer? Yes, our Laser Checks will work in a Laser Printer and Ink Jet Printers. Checks on Top, are the most popular type of checks used for business accounting software such as QuickBooks, Intuit and Quicken. 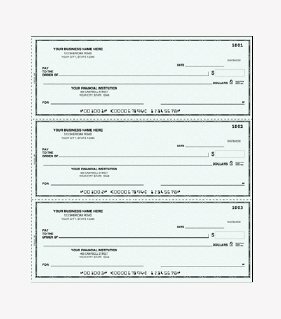 Printed Checks on top (with the company color logo), is a very popular choice, since it’s a multi-purpose check style, with the ability to do more then just accounts payable and payroll. Also it is a full letter size page, making it easier to print from all Laser printers and ink Jet Printers. QuickBooks Wallet Checks. 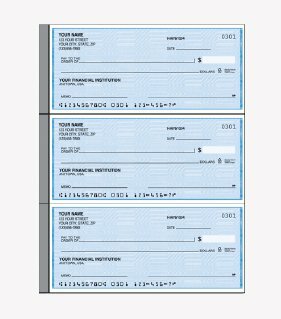 A type of check used in the QuickBooks Checks system, this type has three checks on each page with a small stub on the side. Three Checks to Page Style Checks. 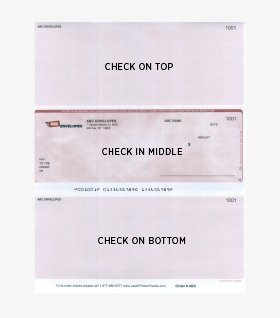 A type of check used in the QuickBooks Checks system, this type has three checks on each page with NO stub on the side.